This is the recipe I make when I head north, up the coast for a break with my buddies. There is a fair bit of preparation involved, which is why it’s good to make this on a holiday where you aren’t under the usual weeknight dinner pressures. I also find it’s best made near an ocean – either on a sultry summers night where you can smell the salt in the air, or equally nice is a rainy, cold lunchtime after a good dunking in the sea. The recipe is kind of a morph of two – part Lonely Planet food guide and some other Spanish cookbook who’s name I’ve forgotten. One of the recipes had rabbit in it – I’ve modified mine to suit non-bunny eating tastes. Paella originated in Valencia (also the home to beautiful oranges) in the mid 19th century. According to Lonely Planet, it was the men that used to make the paella, after working in the fields and orchards. They ate paella together and chatted about bullfighting, farming and women. The dish varies from village to village, and city to city, as I experienced during my travels through Spain. These days I’m pretty sure we women folk are allowed to make it. 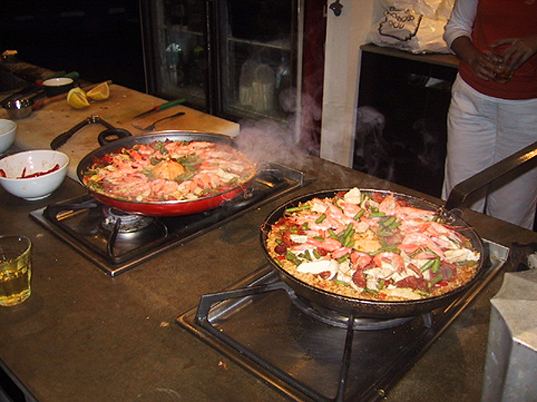 These quantities are estimates based on making one paella, feeding around 6 adults. If you have hungry surfers around and some kids, you might want to up the quantities a little. But get a couple of pans going – rather than stuff everything into one. Speaking of pans, it is handy to have a paella pan (also known as a caldero). It can assist with even cooking and helps create the crust on the bottom. You can then eat it straight from the pan. My pan is by Paelleras el Cid, and it is most revered. If you don’t have one, just use a big flat frypan, or a dutch oven (I still can’t type that without thinking like a 13 year old school boy [or 44 year old man]). Back to cooking techniques. Use a heat source as big as your pan. If you’re on a stove top, straddle the pan over 2 burners. You’ll need to rotate the pan to ensure the heat is distributed evening. A BBQ also works really well. Here’s 2 pans going at once – on 2 fairly big burners (keep watch on plastic handles). Just double the quantities if you need two paellas. Another tip – try and find the best quality rice you can. It’s all about the rice really (like risotto). Prep time – if you’re not in a rush and are enjoying yourself, I would allow at least an hour for chopping and getting organised. If you pulled out all the stops you could do it in half the time. Cook time – allow about 45 minutes to an hour, depending on volume. 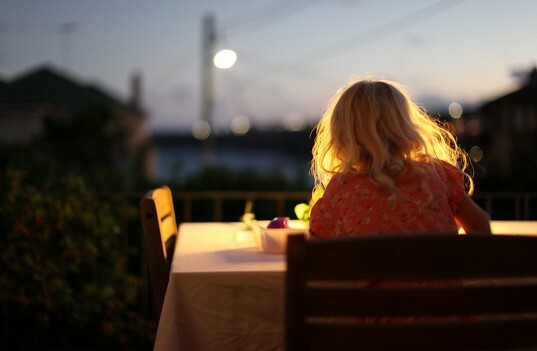 [If you're on holidays, pour yourself a wine, grab some friends and start a conversation as you work]. Getting the red vegies ready: Slice the red capsicum into thin strips and fry (in about 2 tablespoons of olive oil) with the 6 cloves of garlic and spanish paprika until soft. Take out the capsicum and keep the oil mixture for the next stage. Add the whole head of garlic to the oil and then the onion. Fry until soft. Then add the diced tomato and cook until it forms sort of a light tomato sauce. You will need to add some water to it – and S&P for flavour. This forms the base of the paella and is called the sofrito. Rice cooking: Lightly toast the saffron in a dry fry pan. Crush it all up into a powdery form. Add it into the chicken stock. Add the rice and fry for about a minute, making sure it’s evenly covered in oil. Then add the chicken stock. Pour the stock over the rice to cover it, and make sure the rice is evenly distributed. Then let it cook. Don’t stir it again. Put some foil over the pan and let it bubble away for about 20 minutes. Check it now and then – making sure it’s not too dry. Just keep adding chicken stock if it gets too dry. Towards the end of the cooking – crank up the heat so a nice crusty base forms. Taste test a few grains of rice for doneness. Finishing touches: Add the peas, capsicum, chicken, chorizo and cook until the peas are soft. Then add the prawns and put the foil back on so they cook. Add the olives and then it’s ready. Sprinkle with chopped flat leaf parsley and serve with a green salad and a good red. Wait for the applause. delicious! I’ve never tried to make my own paella, I think I must! This was an easy to follow recipe that turned out pretty nice. I even got compliments from my friends who came over to share in my Paella experiment! Next time, I just need to find a Sangria recipe too!